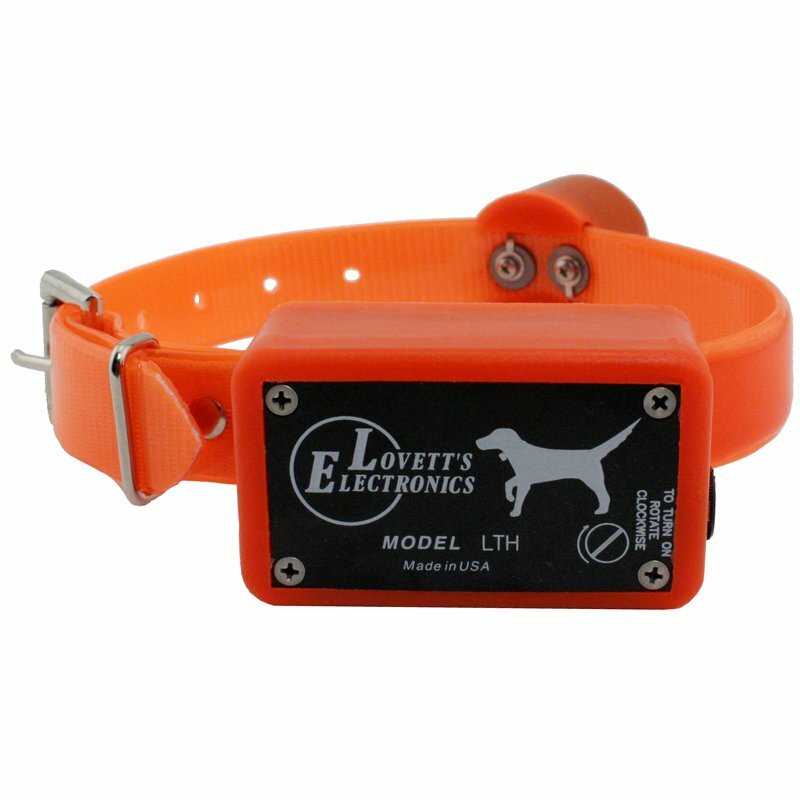 Lovetts LTH Low Tone Hawk Beeper Collar. $94.95. "I once had a collar with a shielded push button power switch. Much more convenient than using a coin." 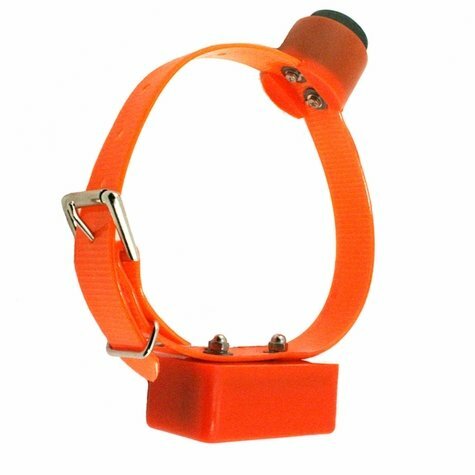 I once had a collar with a shielded push button power switch. Much more convenient than using a coin. Like the versatility of the settings. Easy to hear from a distance and simple to use. Dog adapted very quickly. Only a month into bird season, but so far it's been working great. The only comment I have so far is that it is extremely loud, and there should be a way of adjusting the volume. I put tape over two of the three holes, and its about right for me, and the dogs ears won't be blown out. "Just took a couple times for the dog to get used to it." Just took a couple times for the dog to get used to it. No problems now. Very easy to know his location at all times. Not a big fan of the screw to turn it on. Other than that, works great. Can be programmed for regular, grouse, point only, and you can add a hawk scream for the point signal. The Lovett's "Six in One" beeper can be programmed for regular, grouse, point only, and you can add a hawk scream for the point signal. It can also be programmed to eliminate the point signal altogether and will beep every 4 or 8 seconds for keeping track of non-pointing breeds. The term "regular" through the years has referred to a beeper with 8 seconds between run beeps and 8 seconds delay (from the time the dog stops) until the beeper changes rhythm. This has been the most popular timing sequence because the longer delay to point allows the dog to piddle a little without the hunter hearing too many false point beeps. When programmed in grouse mode, the run beep intervals and the delay to point are shortened to 4 seconds. Since grouse cover is generally thicker some like to keep closer track of the dog and less silence aids in this aspect. Hence the name grouse model. This is purely a matter of preference, you can program the unit to a combination regular or grouse model which could be 8 seconds between run beeps and a 4 second delay to point, or 4 seconds between run signals and an 8 second delay to point (refer to programming instructions). 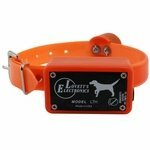 The LTH beeper collar was created especially for those who have a hard time hearing high-pitched sounds. Not only does this beeper emit a lower pitched sound, but its decibel output is higher as well. The result is a beeper that can be heard by nearly everyone. It uses proven state of the art microchip electronics and the best hardware available today. Yet each unit is built by hand in the USA under close inspection and tight quality control. Waterproof, rotating, coin-operated on/off switch molded in the side to eliminate accidental turn-offs. Can be turned on or off in the field without turn on plugs or magnets. Speaker is mounted on the collar to ride on to of the dog's neck. This will make the beeper easier to be heard by the hunter, easier on the dog's ears and will help keep it out of mud and snow. The wires are embedded in the collar which reduces or eliminates the chance of broken wires. Around the rim of the battery compartment is a molded O-ring to ensure the compartment is watertight when the bottom plate is installed. For convenience of programming in the field, abbreviated instructions are printed on the bottom of the battery cover. If two dogs are put on the ground at the same time, it is easy to set the beepers on different programs to distinguish between the dogs. The entire case is made of molded polyurethane. It has no sharp edges to cut or bruise the dog. It is completely waterproof. The beeper is mounted on a duralon collar. 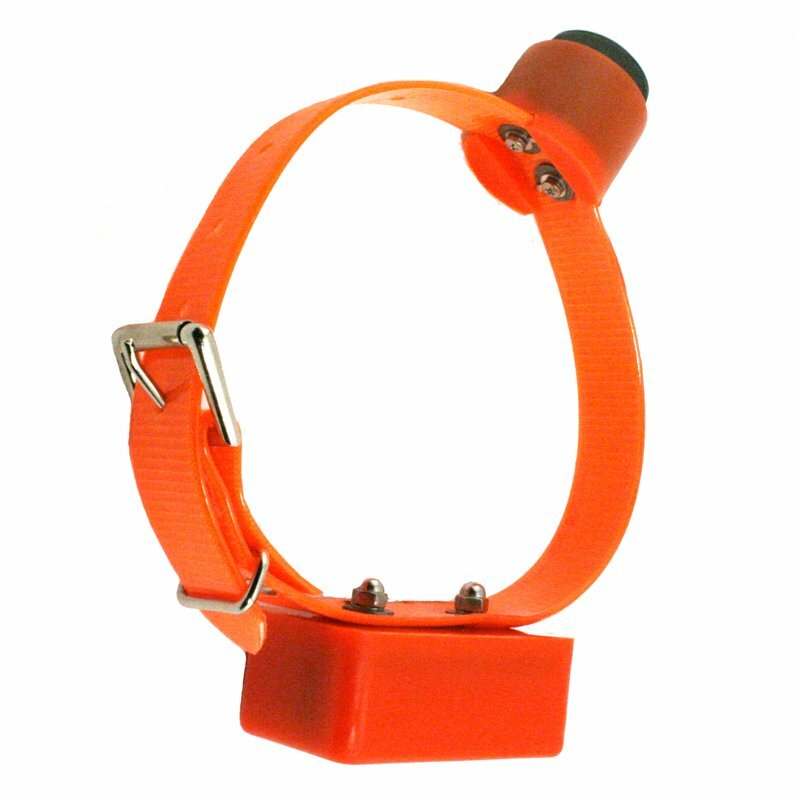 The hunter orange collar has high visibility. The duralon collar is soil and odor resistant and water repellent. 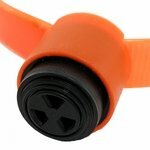 The collar can be cut and holes added without burning or melting like conventional nylon. 1. Turn the beeper ON by rotating the knurled slotted dial on the side of the beeper body. It was designed to use a dime or quarter. Usually a half turn clockwise is enough to do it. This really depends on how far you turned it counterclockwise to turn it off. We ship them so a half a turn or so will turn it on. 2. Hold the beeper as if it were hanging on the dog's neck. Shake it up and down, simulating a running dog. You will hear the run beeps. The next step is to stop shaking, holding it still until the point beeps start. Easier yet, turning the unit upside down accomplishes the same as shaking it. Upside down gives you run beeps, right-side up gives you point beeps. All beepers are shipped in dual mode regular, with a battery. If reprogramming is required, refer to the programming instructions. 3. For battery replacement and access to the programming switch, remove the four screws in the bottom cover plate using a #1 Phillips screwdriver and remove the bottom plate. Remove the battery. 4. Reprogram unit (See programming instructions). 5. Insert ALKALINE (only) battery, terminal end first, then push on the rear of battery until firmly seated. If you unscrew the switch dial part of the way the battery can be installed straight in. 6. Reinstall bottom plate and four screws. Inside the battery compartment, you will find two spare screws, size 4-40 #1 Phillips, for the bottom plate. These are there for your convenience in the event a screw is dropped and lost. The bottom plate must have all four screws installed to ensure water tightness. 7. IMPORTANT NOTE: When to replace the battery? The battery voltage is directly proportional to the volume of the beeper. If you notice a dramatic reduction in volume or loudness, replace the battery then. A battery will last for 50 to 75 hours. If you use a quality ALKALINE battery, a weekend hunter can go all season using the same battery. The Duracell battery was the brand chosen when the molds were designed, therefore they fit the best. After removing the battery, the programmable switch is directly underneath. The switch is labeled 1 through 8 with "on" printed in the upper left-hand corner. To program, some will find it easier to put all the switches in the off/down position. The switches can be manipulated with a small screwdriver, fingernail file, pocketknife or the tip of an ink pen. Note: The switches slide and do not toggle or rock. The following list of codes, for example, "157," indicates switches 1, 5 and 7 are to be in the on/up position. The remaining switches will be in the off/down position. When the switches are in this position (157) the beeper will be in a regular dual mode with a hawk scream for a point signal. The 8 switches all control a certain function of the beeper. Switch 1 on and 2 off will give you a dual mode. Switch 1 off and 2 on gives you point only. Switch 3 controls the amount of delay to point beep once the dog stops to either 4 or 8 seconds. Switch 4 controls the time between run beeps to either 4 or 8 seconds. These two switches, 3 and 4, change the beeper from regular mode to grouse mode. Switch 5 is in the up/on position anytime the unit is programmed in dual or point only modes. Switch 5 would be in the down/off position for run only modes. Adding a hawk scream point signal is done by switching 6 off and switching 7 on with any of the above 4 codes. Switch 8 on gives you two beeps in run and off gives you one beep.